Treat your hair to soft, manageable curls! 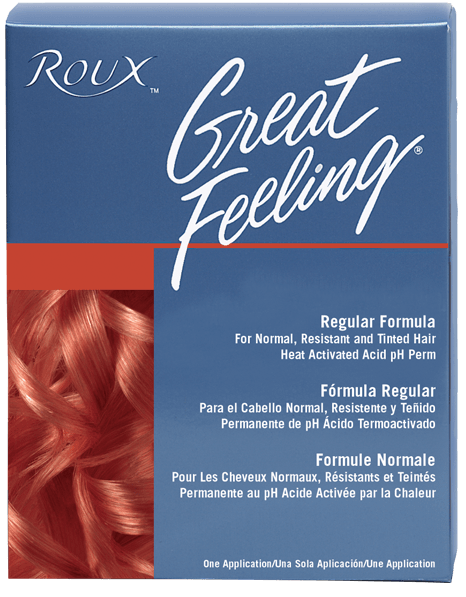 Roux Great Feeling delivers a uniform curl pattern from resistant new growth to porous ends, giving your hair firm, natural-looking curls. Shampoo hair and towel blot lightly. Wrap with water. Hair should be uniformly damp, but not dripping while wet. If hairs becomes dry while wrapping, use very light misting to maintain uniform dampness. Complete wrapping using form consistent tension. Place cotton strip around hairline and towel at nape of neck. Change cotton or neck towel if it becomes wet with lotion. Note: Do not wrap with lotion or any other wrapping aid, or leave-on conditioner. Apply lotion lightly to each rod and then reapply a second time to completely saturate the hair. Do not allow lotion to drip. Blot excess from scalp, forehead, and nape of neck with wet cotton. Set timer for 20 minutes. When time is up, processing is complete. Hair should be rinsed with comfortably hot water using full pressure for 3 minutes. Set timer to avoid under-rinsing. Remove excess water by thoroughly blotting each rod before neutralizing. Apply cotton around the hairline to avoid dripping. Apply Neutralizer to each rod at least twice, making sure all Neutralizer is used. Set timer for 5 minutes allowing Neutralizer to remain on the hair for the full time. When the time is up, rinse thoroughly on the rods with warm water. Remove rods and rinse lightly again. Style as desired.